The miserably endearing life of "MessyOL Tokyo." When I saw the display for A Big Mess at indie manga shop Taco Che, I knew I had to buy it. "Based on a real story!" it said. 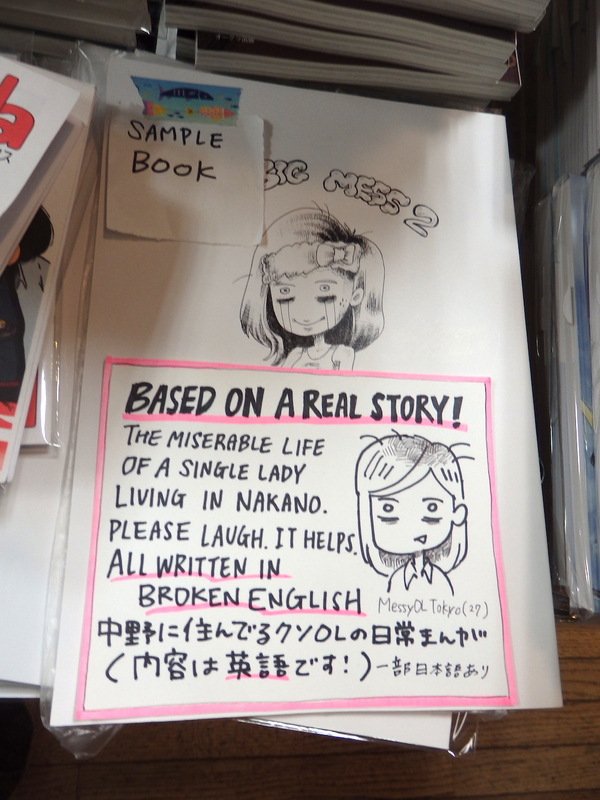 "The miserable life of a single lady living in Nakano. Please laugh. It helps. ALL WRITTEN IN BROKEN ENGLISH." In Japan, manga are just comics (albeit very popular ones), and that means there's a vast range — from mainstream titles, like One Piece, to webcomics to the scribbles in a middle-schooler's notebook. Outside of Japan, we get exposed to the most popular strain of the Japanese comic tradition, but just like here in the US, there are lots of wacky little independent releases that escape the gaze of big publishers. 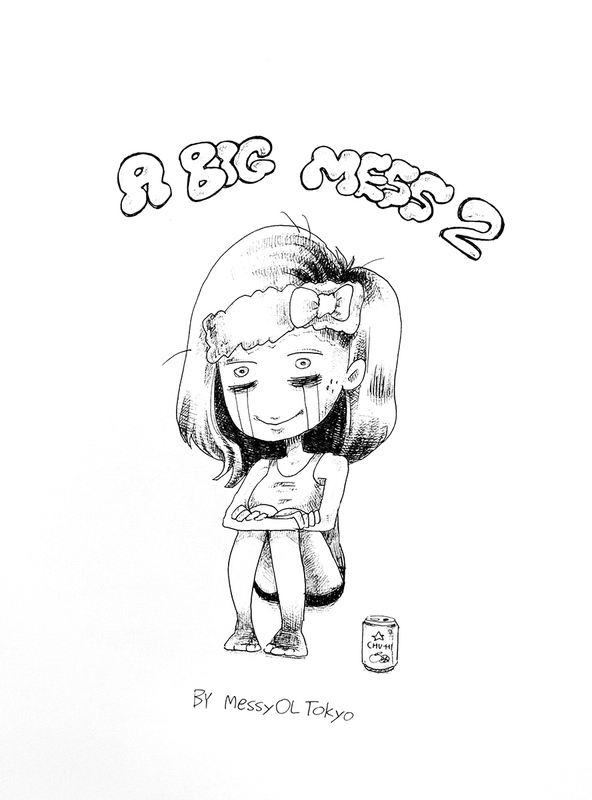 A Big Mess 2 is a crystalized example: part two of a self-published, autobiographical comic zine by the pseudonymous "MessyOL Tokyo." I haven't read part one, but that's part of the fun. 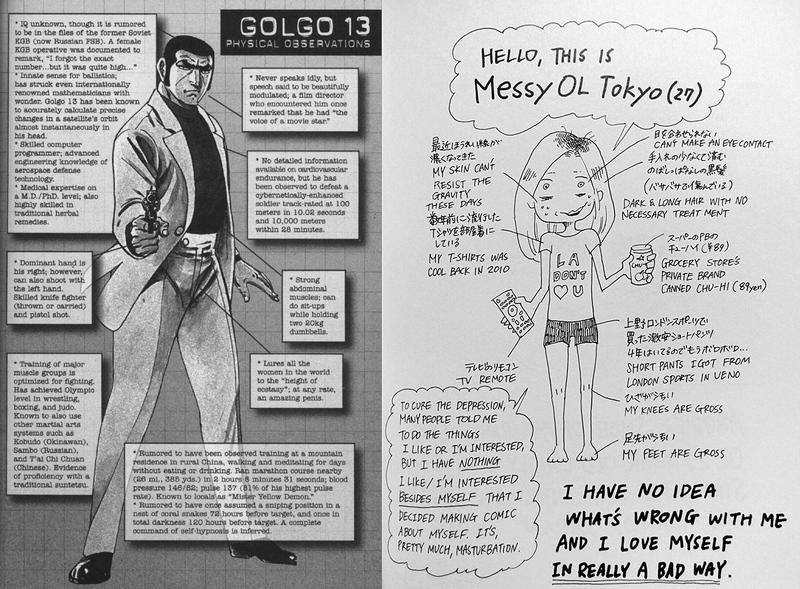 The zine starts with a visual introduction to its main character; it's like the "Golgo 13: Physical Observations" page except that the one in A Big Mess 2 replaces lines like "strong abdominal muscles; can do sit-ups while holding two 20kg dumbbells" with gems like "my t-shirts was cool back in 2010" and "my knees are gross." She also throws in a map of Tokyo's Nakano Ward, where she lives, and includes some restaurant and bar recommendations alongside commentary like "juicy dumplings never betrays." Who would win in a fight: Golgo 13 or MessyOL Tokyo? The rest of the thin book is almost entirely a series of English four-panel comic strips depicting her daily struggles as an OL or "office lady" (basically just the Japanese word for a female white-collar worker). The subjects range from neurotic obsessions over the price of groceries to the pains of getting older. So yeah, it's real as hell — not unlike Studio Trigger's side project Turning Girls , which follows a similarly depressed group of young working women. Most of the strips are quite funny in a dark and understated way, but interspersed in-between are a handful of more solemn reflections on the author's unfulfilling adult life. The art is similarly sparse, with lots of loose pen lines and no screen tone. The designs are pretty simple and economical, but the main character's manic faces stand out and carry the comedy for many of the strips. As you'd expect, the paneling and typesetting are all hand-drawn as well, lending it all a very homegrown charm. Strangely, in addition to the English comics, there are a few Japanese-only ones too. But they're just a small portion of the book. The zine has a single long-form story: a loving, wryly comedic tribute to the author's departed grandfather. The tone is a little different from the rest of the comic, but it ends on a very sweet note and does a good job of breaking up the self-deprecating strips. A Big Mess 2 is a simple book, but it's a bit remarkable in that not only is it written originally in English, but it's really good! It's rare English-speaking fans get this sort of linguistic access to indie Japanese comics. Unfortunately the author and Taco Che are both completely sold out of the zine, so it's impossible to actually get your hands on a copy! 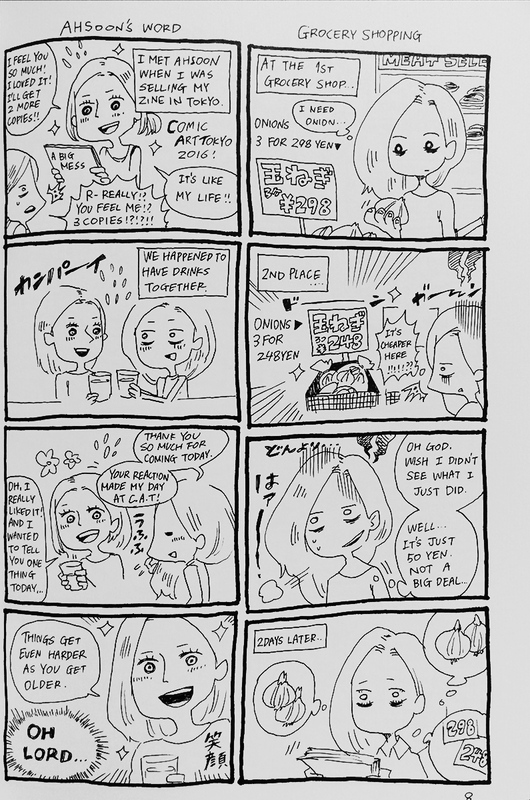 For now overseas readers can check out MessyOL Tokyo on Twitter and her blog, where she posts short comic strips about her daily life in mixed English and Japanese.